We’d love your help. Let us know what’s wrong with this preview of One Dog and His Boy by Eva Ibbotson. To ask other readers questions about One Dog and His Boy, please sign up. I think I may have a new favourite book. This is such an elegantly written, touching, funny story. I only wish I had written it! Hal and Fleck seem perfect for each other; the dog and his boy spend a wonderful weekend investigating the smells and sights of the local park. But when Monday comes Hal is horrified to discover that his parents have merely hired Fleck - his dog has to go back to the rental company. The smouldering rage that Hal feels towards his parents leads him to become the reluctan I think I may have a new favourite book. This is such an elegantly written, touching, funny story. I only wish I had written it! Hal and Fleck seem perfect for each other; the dog and his boy spend a wonderful weekend investigating the smells and sights of the local park. But when Monday comes Hal is horrified to discover that his parents have merely hired Fleck - his dog has to go back to the rental company. The smouldering rage that Hal feels towards his parents leads him to become the reluctant leader of a whole pack of runaway dogs. En route, the dogs have adventures and misadventures on their quest to find new homes. I've been reading this book with my severely disabled brother for a while now. We've been reading a chapter each day and it's been a really pleasant experience. It wasn't until recently we even knew he was interested in books but his one-to-one carer at his new day scheme said he really enjoys story time. Using this information we tested the waters, we quickly figured out the trick to funny voices, keeping him interested and bluffing your way through tongue twisters. This was his first chapter b I've been reading this book with my severely disabled brother for a while now. We've been reading a chapter each day and it's been a really pleasant experience. It wasn't until recently we even knew he was interested in books but his one-to-one carer at his new day scheme said he really enjoys story time. Using this information we tested the waters, we quickly figured out the trick to funny voices, keeping him interested and bluffing your way through tongue twisters. This was his first chapter book with us and it was a huge success. After the first few each chapter becomes a story in itself. This was great for keeping him interested and provided plenty of character arch's within the main plot arch. There's just the right amount of character to stop the story for getting boring but also remaining consistent - with a carefully developed accent for each one my brother, S, soon learnt to differentiate between the characters and pick out his favourites. Then there's the dogs, S has had a dog for three years now and found it easy to relate to the creatures in the book. Even demonstrating actions to us with our own pup to show us his understanding. Lonely Hal begs for a dog and when his rich parents say, "yes," he is over the moon. Only problem? His shallow parents have actually rented a dog named, Fleck, for the weekend. They think Hal will get tired of the dog after 3 days. Instead he bonds with the dog and loves him deeply. Not wanting to tell Hal that Fleck isn't for keeps, the parents sneak him back to the rental place while Hal is at the dentist. Hal comes home, discovers the trick and is devastated. And angry. Ooh... he is one mad dude. He goes to the rental place, takes Fleck and runs away with the help of a friend on an adventure where he discovers not only how to make dogs happy, but his parents as well. This light story has a happy ending, exaggerated characters, predictable plot and will be liked by animal lovers.The adults are dumb and buffoonish in most cases, except the grandparents. There are quite a few unbelievable spots but it is all in good fun. The story was a little slow for me but I'm not exactly a patient reader. I did enjoy how it made me think of our doofy dog and how much I loved her and hated her peeing all over the place. If you are getting a dog, whatever you do, DON'T give it a name that starts with that piddly letter "p."
The late, great Ibbotson's final novel for kids is a bit of a departure from her usual themes. 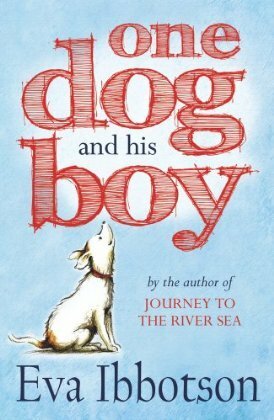 It is essentially realistic fiction and is about the bond between a boy and his dog...and some other dogs. Hal has longed for nothing in his life like he longs for a dog of his own. But his wealthy and tidy parents don't want a messy pet in the house and don't understand Hal's feelings. When Hal meets his doggy soul mate - Fleck - because his parents rent him for the weekend, he can't just let him go b The late, great Ibbotson's final novel for kids is a bit of a departure from her usual themes. It is essentially realistic fiction and is about the bond between a boy and his dog...and some other dogs. Hal has longed for nothing in his life like he longs for a dog of his own. But his wealthy and tidy parents don't want a messy pet in the house and don't understand Hal's feelings. When Hal meets his doggy soul mate - Fleck - because his parents rent him for the weekend, he can't just let him go back to the pet rental agency. Hal takes drastic measures and runs away from home, stealing Fleck in the process. Kayley works at the pet shop but is home with the flu when her little sister, Poppy, takes care of the dogs on the night that Hal sneaks in. Poppy has always felt sorry for the dogs, so she let's out five others and they run away after Hal. Soon, Hal, Poppy, and all of the dogs are on a cross-country trip to find the true homes for the dogs and adventure along the way. This is the story of how beautiful it can be when the right dog is with the right people. 'Often and often when you wanted something and then got it, it was a disappointment ... But having a dog was completely different. He'd wanted and wanted it and when it happened it was even better than he'd thought it would be. He'd imagined some of it - the companionship and the warmth - but he didn't realise a dog would make you laugh so much, or nor that h I loved loved loved this book! Really enjoyed this, but his negligent parents are despicable until the end! The dogs are wonderful! Nói chung là ham chơi quá nên đọc sách cứ đổi qua đổi về rồi ngâm đó. Hồi xưa đọc giỏi lớn lên càng tệ lậu, mình đang tập lại thói quen tốt đó. Quyển sách này thấy bất ngờ lắm, cũng biết tụi nó tình cảm cơ mà không nghĩ là đáng yêu đến zị. Từ hồi chơi vs nhiều bạn thương yêu động vật làm mình cũng dần dần thay đổi ánh nhìn vs tụi nó. Một chuyến phiêu lưu thú vị và trẻ em đã giúp người lớn nhận ra được rất nhiều điều. I read this as a reviewer back when it was first released, and really loved it. Kate and I just finished the audiobook, which was delightful narrated! Although not a fan of YA, this book was thrust upon me .. who am I to say No ?? A lovely, quirky read that fills the heart with hope and joy .. even making you shout out loud to some of the adults portrayed .. that being said, the ending is exactly as you would expect ..
Before his tenth birthday he virtually bombarded his parents with pleas and notes, and finally his father said okay, but not to what Hal thought. His father was going to take Hal to the Easy Pets Dog Agency where you could rent a dog for the weekend. He figured Hal would get tired of the dog very quickly, and would hardly notice when they returned it. But Hal and the little mutt Fleck felt immediate and mutual devotion, and Hal’s mother had to trick Hal to get Fleck back to the Agency. Hal, desperate, prepared to rescue Fleck and run away. At the Agency, he won the assistance of the little girl Pippa who was helping to take care of the dogs. She not only went with him, but she freed all of Fleck’s other dog friends in Room A. All of them headed out to Hal’s grandparents, who Hal knew would be accepting. Along the way they were chased by greedy adults who were after the large monetary reward publicized for Hal, but the two children also made a number of helpful and wonderful new friends. The dogs too found “soul mates” along the way. Thus, Hal and Pippa and all the dogs learned what it meant to feel as if you were “home,” and even Hal’s parents started to learn as well. Evaluation: How can you not love a book about dogs that don’t die? ….Only in this case, it was the author who died, days before seeing the page proofs for this book. She left lots of adoring fans behind, including me. This book is meant for middle grade readers, but will endear readers of any age. 'One Dog and His Boy' by Eva Ibbotson is her last book for children. This extraordinary writer and winner of many awards died days before seeing the uncorrected proofs of this book. She would be proud of the final result. All Hal wants in the world is a dog. His parents have so much money they couldn't possibly spend it all, and they shower Hal with gifts, but refuse to get a dog. "Too smelly, too messy, and liable to scratch the furniture" are just a few of the reasons his mother gives for not al 'One Dog and His Boy' by Eva Ibbotson is her last book for children. This extraordinary writer and winner of many awards died days before seeing the uncorrected proofs of this book. She would be proud of the final result. "Too smelly, too messy, and liable to scratch the furniture" are just a few of the reasons his mother gives for not allowing a living creature in the house. She doesn't allow living things outside the home either, having a garden that consists of raked gravel so no messy dirt gets inside. Finally, when nothing else will make Hal happy, his father rents him a dog -- an adorable little "Tottenham Terrier" or rather, a pure mutt or mongrel (the book is British, after all). When Hal gets home from the dentist and the dog is gone, he finds out that Freckle never was his permanently -- just rented for the weekend. After losing his dog, nothing matters to Hal. His parents tell him that the dog will forget him, and he believes them. However, introduce a few quirky characters and fate -- and the result is Hal on the lam with Freckle, the younger sister of their caretaker, and several of the other rentable dogs. I finally got around to reading One Dog and HIs Boy, and it really is a delightful read. It's so very sad that Eva Ibbotson died just a couple of days before the proof copies were ready for her to see, she is a great loss to children's literature. The story has a strong moral feeling throughout, yet is written to appeal to children of all ages. Younger children will enjoy the adventure story and older ones should take on board what Ibbotson is trying to tell the reader; that material things are no I finally got around to reading One Dog and HIs Boy, and it really is a delightful read. The story has a strong moral feeling throughout, yet is written to appeal to children of all ages. Younger children will enjoy the adventure story and older ones should take on board what Ibbotson is trying to tell the reader; that material things are not as important as love and affection. It is a story of determination and loyalty. Hal, the little boy who has everything, everything except what he wants most in the world - a dog. Fleck - the little dog who comes along and steals Hal's heart. The other ill treated dogs from the 'rent a dog' agency - each one of them a wonderful character in themselves. The people Hal meets during his travels - the circus staff, the abbot and of course Pippa. I'm not really a dog person; I say that knowing it is probably a huge flaw in my character. And yet, I was completely charmed by this book -- which, although it is about many things, is primarily about the loyal and loving nature of dogs. The main characters in the book take a strange sort of odyssey, and the best bit of it is that a group of unique dogs all manage to find the right owner to belong to. When I read Ibbotson's books I always feel that her character and all of her most strongly held I'm not really a dog person; I say that knowing it is probably a huge flaw in my character. She was born in Vienna, Austria, in 1925. When Hitler came into power, her family moved to England. She attended Bedford College, graduating in 1945; Cambridge University from 1946-47; and the University of Durham, from which she graduated with a diploma in education in 1965. Eva Ibbotson (born Maria Charlotte Michelle Wiesner) was a British novelist specializing in romance and children's fantasy.